After sending cargo towards the International Space Station, the first stage of the Falcon 9 rocket will return nearly immediately after liftoff and return and fire its engines for the second time. The burn will allow the rocket to reenter the atmosphere in controlled flight, without breaking up and disintegrating on the way down as most booster rockets do. The launch was delayed to March 30th. The machine will settle over the Atlantic Ocean off the coast of its Cape Canaveral launchpad, engines roaring, and four landing legs will unfold from the rocket’s sides. Hovering over ocean, the rocket will kick up a salt spray along with the flames and smoke. Finally, the engines will cut off and the rocket will drop the last few feet into the ocean for recovery by a waiting barge. Future flights of the so-called F9R rocket will have it touching down on land. For now, a water landing ensures maximum safety in case the rocket goes off course. After recovering the rocket from the water on Sunday, SpaceX engineers and technicians will study it to determine what it would take to refurbish such a rocket for reuse. 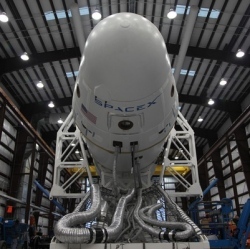 SpaceX also has plans to recover and reuse the second stage rocket, but for now, it will recover only the first stage and its nine Merlin engines, which make up the bulk of the cost of the rocket. Even without reusable rockets, SpaceX has already shaken up the $190-billion-a-year satellite launch market with radically lower launch costs than its competitors. The company advertises $55.6 million per Falcon 9 launch. Its competitors are less forthcoming about how much they charge, but French rocket company Arianespace has indicated that it may ask for an increase in government subsidies to remain competitive with SpaceX.